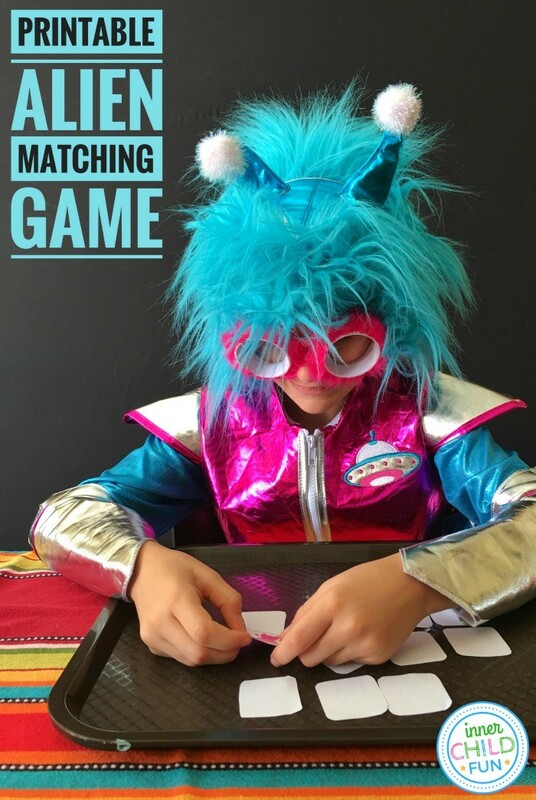 This space alien matching game is quick and very easy to set up! This would be a great activity for a rainy day or anytime you need a bit of a break. I love how simple it is to print it out and play! Be sure to check out the recommended reading list at the bottom of this post for a space themed story time that is out of this world! Begin by downloading the .pdf file for the free printable space alien matching game. To access the file, you will need a .pdf reader installed. If you do not already have one, you can download the Adobe Acrobat Reader for free here. 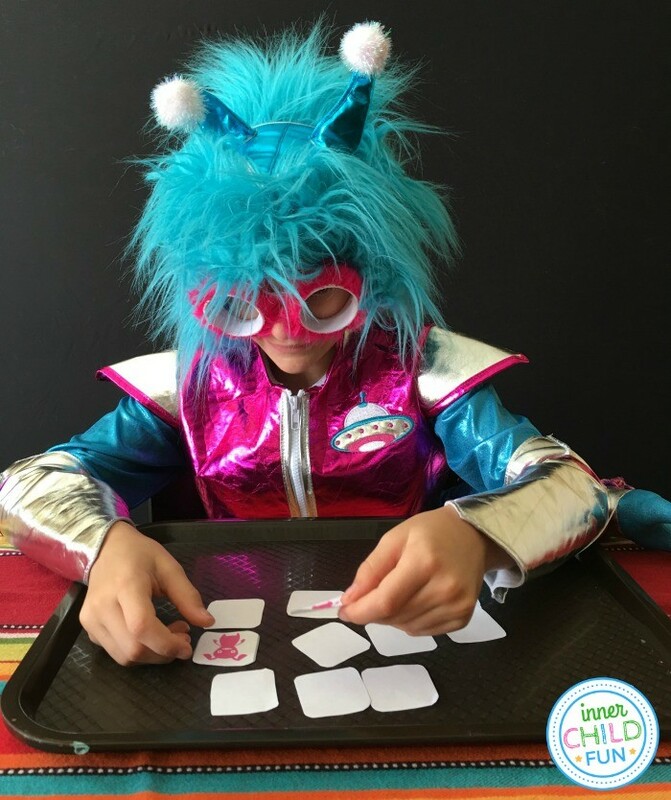 Click here to download the free printable space alien matching game template. Next, invite your child to use safety scissors to carefully cut out the individual game pieces. 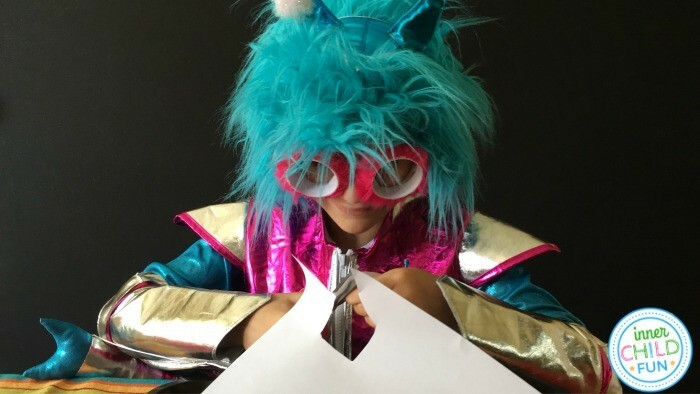 This is great practice for kids who are working on developing scissor skills! Step 3 – Time to Play! Once all of the pieces have been cut out, arrange them all face down on a flat surface. Take turns flipping over two cards to try to make a match. If a match is made, 1 point is given, and the cards are set aside. If no match is made, the cards are placed back in their original spots face down again. When all of the cards have been matched up, the player with the most matches wins! Tip – for a more challenging version, create more game pieces by printing and cutting out 2 or more copies of the game template. 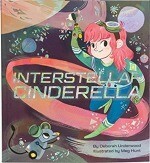 Interstellar Cinderella by Deborah Underwood — (ages 4-7 years old) This is a creative re-telling of the Cinderella story with a fun space-themed twist! We loved the ending, and it became an instant favorite in our household. Peanut Butter and Aliens by Joe McGee — (ages 3-7 years) The sequel to Peanut Butter and Brains in which the zombie residents of Quirksville face an alien invasion that cause panic and confusion. Thankfully, Reginald has an idea to bring peace (and tasty sandwiches) to the universe! Mousetronaut by Mark Kelly — (ages 4-8) Meteor the mouse would love to travel to space, but the other mice think he is too small. When a key on the control panel gets stuck in a tight spot, will Meteor be able to save the day?